ARMS didn’t impress me at first. Here was Nintendo with a new and exciting console, and what was its first brand-new IP? A souped-up Wii Boxing. I found the game’s motion-controlled punches difficult to land. After going a couple of rounds with little idea why my blows weren’t landing, I walked away achy and deflated. Fast-forward five months ti the game’s launch and although it still makes me ache, my opinion of ARMS couldn’t be more different. It turns out, Nintendo’s latest creation is far from the waggle-fest I first assumed it to be. Doing away with the dramatic and limited gestures that defined the Wii era, ARMS proves that the Switch’s Joy-Cons are capable of infinitely more subtlety. In fact, after spending quite a few hours brawling away, I’d even go so far as to say that this colourful fighter makes one of the best cases for motion-controlled gaming in recent memory. 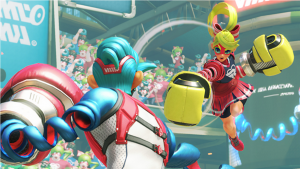 In a nutshell, ARMS sees Nintendo doing to the fighter what Splatoon did to the shooter – taking the genre apart and reassembling it into something new. With up to four fighters duking it out in fully 3D arenas, players use motion controls to both move their character and aim the punches from their ludicrously long arms. While on paper this control scheme sounds like it may be a complete disaster, the bizarre setup quickly became second nature. Instead of pointing the Joy-Cons towards the TV, as you woul a Wiimote, this colourful fighter demands that you hold them in what Nintendo calls the ‘thumbs-up grip’. This alien setup sees you resting each Joy-Con in your palms and clutching the controller in a fist, leaving your thumbs free to access the two shoulder buttons. It’s definitely odd, but once it clicks, it opens up some pretty interesting motion-controlled gameplay possibilities. 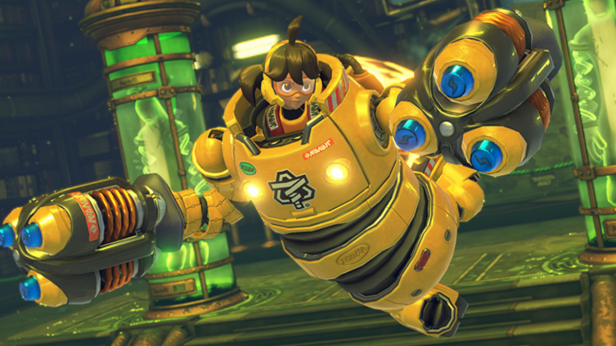 Unlike Wii Boxing, the key to victory in ARMS lies in mastering its subtle movements. As you’d expect, extending an arm out in front of you delivers a forward-facing blow with your fighter’s corresponding arm. Yet the real test of skill lies in curving your blows. When you add a slight twist of the wrist to your punch, your character’s spaghetti-like appendage curves in the same direction. It isn’t perfect, but time and time again I found myself impressed by just how accurate the Joy-Con controllers were in picking up my movements, allowing me to unleash winding punches at exactly the right angle and direction. The challenge, however, comes from landing those tricky punches while also keeping your character moving. Here, tilting the Joy-Cons without extending your arms makes your fighter move in the desired direction, and a tap of either L or R allows you to dash or jump around the arena. Initially, moving without punching is infuriating, but once it clicked, seamlessly dodging and aiming with subtle flicks of the wrists worked like a dream. 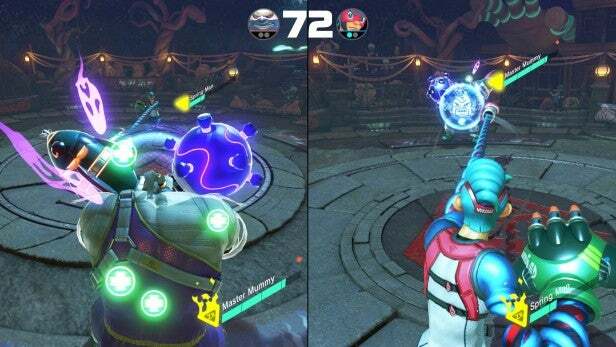 With fighters such as the Naruto-esque Ninjara able to teleport in mid-air, much of the challenge in ARMS comes simply from predicting where your target will move and curving your wrists accordingly. Thankfully, though, there’s more to ARMS than simply punching and dodging. Nintendo has seen fit to borrow two other crucial fighting game mechanics: throws and blocks. Like most fighting games, ARMS operates a rock-paper-scissors methodology, where guards beat punches and grabs beat guards. Here, extending both arms together grabs your opponent, and turning your thumbs inward to face each other initiates your guard. Grabs are a sure path to victory, since once you’ve wrapped your stringy appendages around your opponent, they’re left entirely helpless. The catch is that if you reach for a grab and miss, your arms are left dangling – leaving you completely defenseless. Individually, they’re all fairly simplistic mechanics, but thanks to careful balancing and the ability to unleash game-changing special attacks, everything comes together to create a surprisingly complex meta game. Speaking of the meta, the rest of ARMS’ depth lies in how you choose to combine your chosen character and their arms. 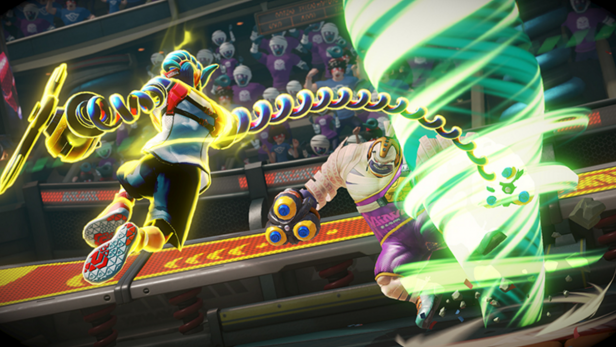 Each fighter in the game starts with a selection of three default arms, and sports their own custom ability. With characters ranging from the hovering Twintelle to the sluggish Master Mummy who heals himself by blocking, I was pleasantly surprised at just how much depth there was in combining characters and arms. Arms range from standard, straight-punching boxing gloves, to blade-shaped discs that curve and weave around your foes. Of the 30 different ones available, there’s an almost overwhelming number of different ways to fight. And as well as you contending with your enemies, random stage items that heal and disrupt players also add an element of unpredictability to each match. Unfortunately, how you go about unlocking arms is incredibly frustrating. While each of the game’s 10 fighters starts out with three unique arms, you have to go through a mini-game in order to unlock the rest of their arsenal. As you win in Grand Prix and pummel your foes in online bouts, you’ll earn a couple of coins from a win, with a minimum of 30 needed to compete in the arms-unlocking mini-game. Annoyingly, once you win an arm, it’s only for that individual character. This means that in order to unlock your favourite combination of arms for every fighter you’ll have to put in a ton of hours. As a purely single-player experience, ARMS leaves a lot to be desired. While there’s definitely fun to be found in the seven offline modes on offer, most consist of self-contained 99-second matches. This is perfect for getting a quick fix when you fancy just letting your fists fly, but for players who are looking for lone modes to sink their teeth into, there are only really two that fit the bill. Grand Prix is the first, and is essentially your bog-standard arcade mode. After picking a fighter, you select a difficulty rating between 1 and 7 and then face 10 randomly selected opponents, before going head to head with two hard-as-nails final bosses. In a nice touch, Nintendo has opted to let players save their Grand Prix progress, meaning that if you find yourself stuck on a particular battle, you can try again another day without having to start from scratch. The second single-player mode that will keep you occupied for more than a couple of minutes at a time is One On 100. As you’ve probably guessed, this mode sees you taking on 100 enemies with one life – and it’s fine, if unremarkable. Given people’s regular criticisms of Nintendo’s approach to online gaming, it’s interesting that networked matches are where ARMS really shines. Borrowing the ranked matchmaking system from Street Fighter IV, players are able to carry on playing solo and local matches while they wait for an online opponent to match with them. Each win fills up your experience bar, helping you swiftly climb the ranks. A loss, however, sees you lose a far smaller degree of experience, setting you back slightly without ever feeling overly punitive. It’s a setup that shows that Nintendo is taking competitive ARMS seriously, with the point hammered home by the fact that you have to complete at least one rank 4 Grand Prix before you’re even allowed to compete in ranked brawls. Outside of ranked matches, players can compete for those precious coins online in the more laid-back party mode. Throwing players into a nicely designed lobby, the game matches you with a bunch of strangers, chucking you into a round-robin series of random game modes. These include the fun sport-based modes – V-ball and hoops – that add fighting-game flair to basketball and volleyball. There are also team fights, the target-punching Skill Shot mode, and co-op battles that see you teaming up to defeat the Grand Prix boss. The variety on offer here is fun, and like Mario Kart 8 before it, it’s nice to see that you can hop on party matches with a local multiplayer friend in tow. 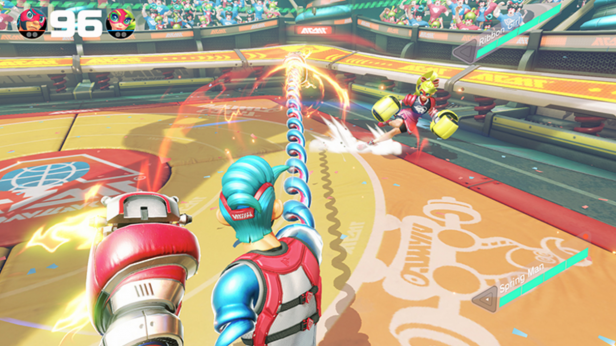 ARMS is a unique-feeling brawler with a surprising amount of depth. It also looks great, combining a colourful flair with some of the most realistic environments and characters. Its motion controls are also a resounding success. Yet, despite everything it does right, this won’t be a game for everyone. 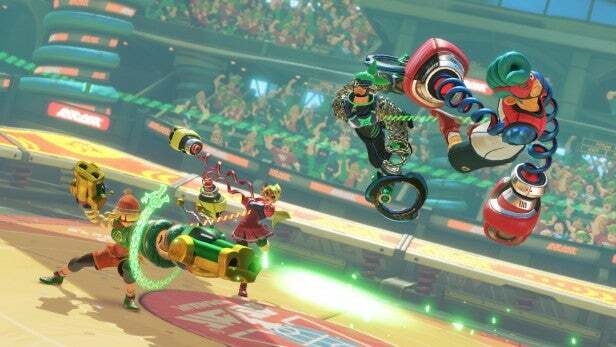 Lacking the meaty single-player component of a game such as Splatoon, ARMS lives and dies on local and online multiplayer. If you’re after a fresh and fun way to take on your friends and the rest of the world, this may be a game for you. If not, however, ARMS’ lack of single-player content might leave you feeling pretty disappointed. The post ARMS Review appeared first on Trusted Reviews.